If I tell you that she grew up in Somerset in a house with no television, among six other siblings without any inkling about pop culture, and still has nothing to do with Facebook or Twitter, you’ll probably picture some introverted denizen of Cold Comfort Farm or a traumatised spinster from a chilly Victorian rectory. There is, however, nothing rustic or weird about Sophie Bevan. 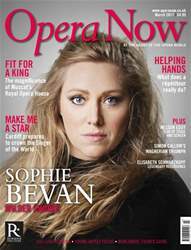 The only notably old-fashioned things about this soprano are a love of J S Bach and a serious dedication to her job. Now 33, she is in the prime of a career that seems to be on the point of pivoting from Handel and Mozart towards redder meat. Family history would seem to have destined her for it. There are two very strong genes in the Bevans: music and fecundity. By general Bevan standards, Sophie’s family of seven kids was actually pretty modest. Her father David was one of 14 children of Roger Bevan, head of music at Downside School, a Catholic establishment near Shepton Mallet. Uncle Tony has 10, uncle Joe 11. The result: Bevans, Bevans everywhere… Roger’s brother Maurice was a member of the Deller Consort. Baritone Benjamin is another uncle. Little sister Mary, a year younger, is a successful soprano hot on Sophie’s heels. Three of their first cousins are budding tenors at the Royal College and the Royal Academy. Sixteen or so of these cousins still get together now and then as the Bevan Family Consort.